Probably with The French Gallery, 120 Pall Mall, London, Winter, 1865. 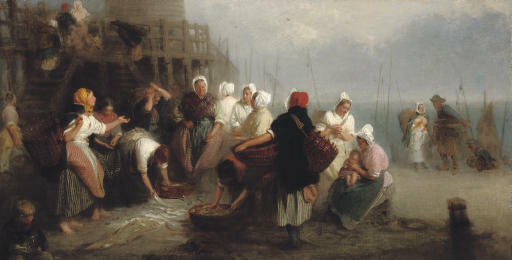 This painting is one of three that John Morgan painted in the fishing village of Newhaven, just north of Edinburgh. Morgan had taken his family to live there immediately following the opening of the Royal Academy exhibition in 1865: they remained there for about two years. Extracts from Morgan's diary of 1865 help place the picture. On 9 May he wrote: 'I was much pleased and my imagination excited by the shipping I saw there, we walked on to Newhaven, were I was to find all I wanted. The costumes and dwellings of the fisherwomen greatly delighted. Their petticoats striped and coloured, their baskets and their outer stairs appeared to me most picturesque'. On 8 June he continued: 'I now made a sketch of my third picture, which I called the 'Fish Market - make your bid'. This was a large picture & gave me immense difficulty. It was also very expensive for I had to give 3/- for the day to my models. I also gave a lay figure for which I paid 25/- a month. All this together with the cost of carriage of frames from London & double rent going on in Edinburgh & the rent in Aylesbury made the picture very expensive. But I was so exceedingly well, never knew what it was to be tired, had such vigour, that I felt it w'd be an excellent move to come to Edinburgh for a permenance'. The painting marked a return to Morgan's ambitious multi-figure works. His son Fred Morgan (1847-1937) aged 18, who had left school at 14 and by this time was exhibiting his own works, would have helped his father with the twenty six figures. The picture was bought by the London dealer Thomas Wallis of the French Gallery, 120 Pall Mall, London. The diary continues on 14 November 'All this time Wallis was going about opening his Winter Exhibition & wrote to see what I had been doing. I sent up 2 pictures of 'going to the boats' and 'coming from the boats' but though he liked them a little the price he said was too high. Sometime after he saw the third picture 'the fish market' & proposed for all three which I accepted £240 for all three'. Wallis entered the two earlier works at the British Insitution, and kept the third - 'The Fish Market' - presumably for his own gallery. We are very grateful to Terry Parker for his help in preparing this catalogue entry.